We are very lucky that in Barnsley there survives a list of the soldiers, sailors, airmen and nurses who were serving abroad in late 1917, early 1918 in the form of the 1918 Absent Voters' List. This was compiled following the changes in electoral franchise extending the vote to all men over 21 and to women over 30 who fulfilled certain property requirements. This page on the Long, Long Trail website lists other Absent Voters' List which are known to exist. The above snip shows the format of the Barnsley book which covered the town centre and some outlying villages; Mapplewell, Monk Bretton, Barugh, Darton, Gawber, Smithies, Ardsley, Hunningley, Shepcote and Hoyle Mill are included. Similar to the format of standard Register of Electors the list is arranged by Ward and Polling District and then by streets within each District. House numbers are given and often give clues to now lost addresses such as Wright's Terrace (off Buckley Street) or Agnes Pit Yard (off Agnes Road). In this special listing we also have each man's service number, his rank and the battalion and regiment (or ship) in which he was serving at the time the list was produced. This can be invaluable for finding further records for a serviceman. Unfortunately the war was not over and the list does contain names of men who were killed, or wounded and discharged or who were taken prisoner of war after it was created. Some men will also have changed regiment or rank. As with all historical records it is important to understand how it was produced, when and for what purpose. The data can be inaccurate or incomplete as it was initially supplied by the next of kin of the serviceman to the registration officers. Some men appear on the Barnsley lists at unexpected addresses ... it could be the address where their wife was staying while he was serving, a parent's house or a friend, it could be a purely convenient postal address for a man who had no particular fixed abode who chose to have his vote registered at a friend's address. We photographed all the pages of the book one morning in the Discovery Centre in Experience Barnsley (aka Barnsley Archives) and the transcriptions have been done by individual researchers who are interested in a particular war memorial or an area or who generously responded to a piece about our project in the Barnsley Chronicle. Our grateful thanks to: Stephen Bailey, Marilyn Stenton, Mark Green, Lynn Knowles, Ken Richardson, Michael Chance, Mandy Shepherd, Pat Pope and members of the committee. If you are interested in seeing the book it can be requested in Barnsley Archives and will be fetched up from the store for you to see. There is a second copy which contains handwritten amendments often noting men who have been killed or taken prisoner. When we complete the checking of our transcription a copy will be deposited with the Archives for use by all visitors. 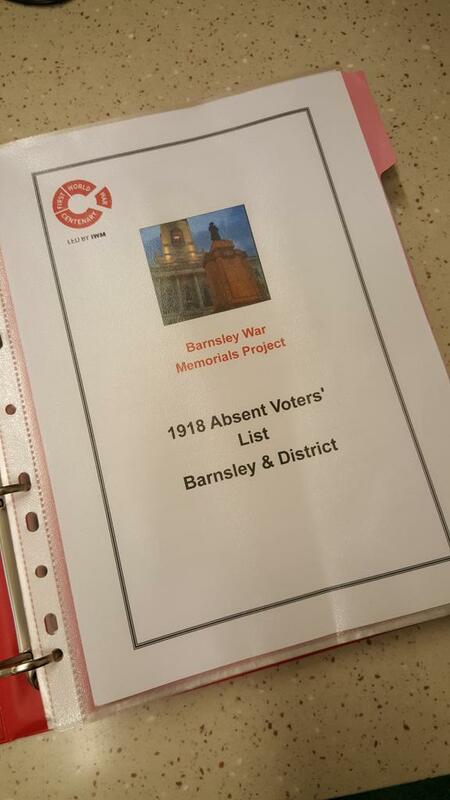 Update 9 July 2015: The completed file was handed over to Barnsley Archives today. It contains an alphabetical list of over 6000 men from the central wards of Barnsley, plus the neighbouring townships. Names, addresses, and military details are all included. We have also included the names of the Absent Voters from the Hemsworth area (see below). The names from St Edward's parish in Kingstone also appear at the back of the new book "Remembering Kingstone in the Great War"; the names for St John's, St Peter's, St George's and St Mary's are now complete. Click on a link below to go to a dedicated page for each parish complete with map of the streets in the area. Not provided in the same format unfortunately, but the names and addresses of men in the services can be picked out. Follow this link to another page for more information and to download the lists we have transcribed. Towns and villages which are in our area included are Cudworth, Shafton, Royston, Carlton, Brierley, Houghton Magna (Great Houghton), Houghton Parva (Little Houghton) and Woolley (which is partially in our area). Again, only in the simple format, names and addresses. This division is available on Ancestry and we will, in time, pick out all the men indicated as absent voters in the 1918 register and provide an index. Towns and villages which are in our area included are Birdwell, Blacker, Billingley, Bolton upon Dearne, Darfield, Dodworth, Elsecar, Goldthorpe, Hemingfield, Hoyland Common, Hoyland Nether, Jump, Low Valley, Stainborough, Thurnscoe, Wombwell (4x wards), Worsborough Bridge, Worsborough Common, Worsborough Dale. Towns and villages which are in our area included are Cawthorne, Hazlehead, Hoylandswaine, Hunshelf, Langsett, Millhouse, Silkstone, Penistone, Tankersley, Thurgoland, Wortley. Thank you for the link Paul.